The Rockridge community bid farewell to its 214 graduates at the Commencement Ceremony held at the beautiful Orpheum Theatre last night. What a special time for these fine young people and their families! I’ve been asked to share my speech, so here it is … complete with a few visuals to enhance the content! It is with great pleasure that I have this opportunity to say a few words to and about the Grad Class of 2018. We are celebrating your 13-year journey that has brought you to this juncture. It is such a privilege having known some of you throughout those first 8 years. And now five years later, after I wished you all the best as you headed off to high school and shook your hand as you crossed the slightly less elegant elementary school gym floor, we meet again to celebrate together. This is a special moment for me, too. and such an honour. 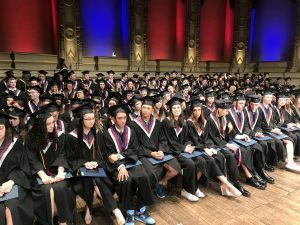 Although I have been principal of Rockridge for a mere six months, I feel like I know a fair amount about this grad class from the conversations I have had with staff members and parents, the interactions I have had with many of you, and the events I have attended where you have been impressive role-players. This may have been on the stage, in the gym, on the field, in the classrooms, or throughout the community. What I am seeing and hearing is that you are respectful, giving, caring and kind, resilient and you are known to look out for one another. I hear all the time, ‘What a great group of kids’. A recent email we received from the Host Chair at the BC Hockey Midget Championships held in West Vancouver over spring break, validates this. Mrs. Nancy Mckenzie stated, “We had over 50 volunteers and …. 25% of them were past or present Rockridge students.” She commented that many of them didn’t even need the volunteer hours, they just wanted to give back to their community. She went on to write, “Between the school, the parents, and the community, we have created a group of engaged, helpful citizens who willingly give back to their community, and I think that is something we should collectively be very proud of.” I couldn’t agree more. May 1st was the day when Nardwuar the Human Serviette graced us with his presence at Rockridge. Many of you gathered in our library at lunch to meet this well-known character and hear what he had to say. If you are not familiar with Nardwuar, he is a Canadian interviewer and musician, recognizable by the tartan tam set upon his head. He is well known for his unique interview style and techniques and his uncanny knack of digging up facts about the individuals being interviewed. 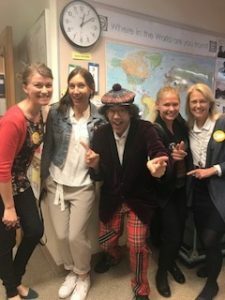 Ms. Carrie Lehman, our amazing Art teacher, attended Hillside Secondary with Nardwuar and invited him to Rockridge, knowing that many of you enjoy watching his interviews on YouTube. He agreed – there again, an example of that willingness to give back to one’s community. Nardwuar imparted many words of wisdom to the students, including ‘keep trying and never give up’. But what I really enjoyed about this informal presentation, were the memories that Ms. Lehman shared about being in high school with Nardwuar, her charismatic class president. Here they were, thirty years later, laughing together about their experiences–from jello wrestling to math class woes. My point is, the people amongst you will be in and out of your lives for at least the next 50 years and you will have the bond of shared high school memories. Perhaps you don’t really know now what memories will stick with you as you leave Rockridge, yet I can assure you that down the road you will encounter a former classmate and say, remember when…? Those ‘remember whens’ will be special moments. As you launch into the next stage of your life’s journey, I’d like to give you three pieces of advice. My first piece of advice is simply to notice. In a world in which technology connects us, one in which ‘selfie’ has been recognized as a legitimate word in the Oxford Dictionary, please don’t lose sight of the importance of paying attention to others. Look outwards – around and beyond you and notice who is out there. When presented with the opportunity, don’t hesitate to make an effort to reach out and offer your support. Small gestures of goodwill go a long way. Rely on your heart to guide your actions. Sometimes it takes just one person to make a difference in another’s life, and that one person could be you. Please notice. Secondly, don’t fear failure. 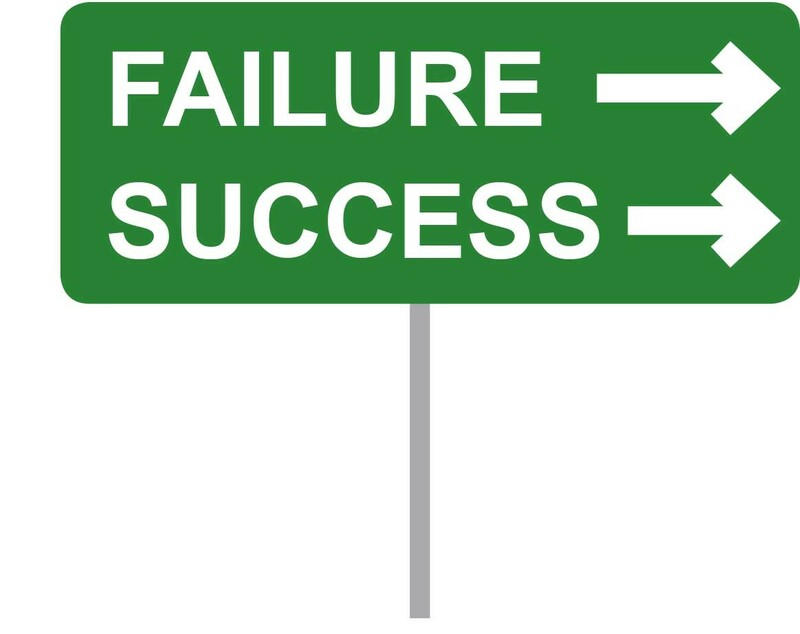 Try not to take the path of least resistance in order to avoid failure. It is tempting – I’ve done it; we’ve all done it. It’s easier to experience success by choosing the less daunting road, yet I encourage you to be risk-takers and challenge yourselves. By taking a more difficult route, you undoubtedly will encounter obstacles and setbacks where you will have to apply your critical and creative thinking skills to bring you closer to success. If you falter, you will learn humility and this will help you grow. Employers today seek resilient and adaptable employees, ones who can solve problems adeptly and handle the curve balls thrown their way. 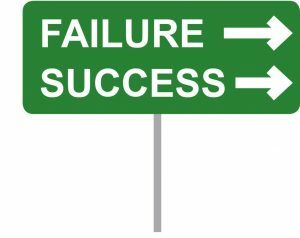 Former White House Chief of Staff and current Chicago Mayor Dr. Rahm Emanuel once said to a class of graduates, “You will have failures in your life, but it is what you do during those valleys that will determine the heights of your peaks.” Please, don’t fear failure. And finally, be optimistic. How often do you hear people lamenting how the world has changed – how are young people going to manage in such unpredictable economic and political times? It’s easy to paint the present situation in our world with a negative brush and shake our heads in dismay. I encourage you not to fall into that trap and get caught up in negativity. Were the good old days really all that great? Probably not, but I think people tend to glorify the past. 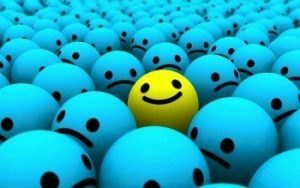 I encourage you to embrace our changing world and have a positive outlook. In education, we often refer to learning as being a ‘messy’ business. It involves trial and error, patience and perseverance. Life may very well be ‘messy’ for you too. 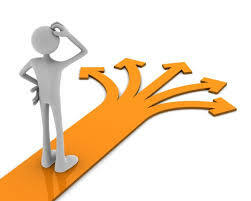 You may struggle, feel lost, doubt your pathway, and contemplate switching gears. That’s OK. Don’t be discouraged; believe in yourself. Use your many gifts and talents to take advantage of the wonderful opportunities ahead and add to the greatness already in our world. Please be optimistic. I have encouraged you tonight to notice, to not fear failure, and to be optimistic. In closing, a quote by author Roy T. Bennett resonated with me and I hope you will think about his words as you venture forward. 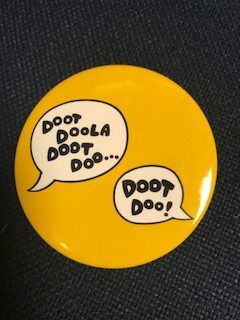 As I was speaking about Nardwuar earlier, I thought it only fitting to end my words using the same trademark phrase that he uses to signal the end of his interviews. I’m sure he wouldn’t mind. 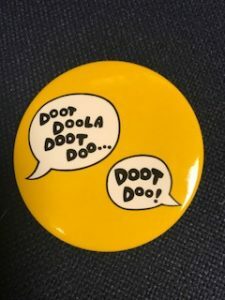 Doot Doola Doot Doo …Doot Doo!